Vegetable waste can be used as fuel. Scientists in Novosibirsk are researching ways to chemically modify dust, straw, green tea, and other plant-based matter and increase the heat of combustion levels for such matter to create efficient bio-fuels. Researchers and scientists attached to the Institute of Solid State Chemistry and Mechano-chemisty (ISSCM) in Russia’s third-largest city, Novosibirsk, are trying to create energy from agricultural and forest waste. They are working on creating new fuels made from plant biomass with heat of combustion levels similar to brown coal. This is achievable, they believe, by increasing the content of several substances, like lignin, which is one of the main components of the aroma of vanilla in old books. Lignin is found in practically all land plants, and gives plant cells their stiff walls. It has long been known that vegetable waste can be used as fuel. This reduces electricity costs and helps save money on heat and waste, besides adding to conservation efforts. "There are many kinds of plant biomass; sawdust, straw, hull, husks from rice, linen, corn, and waste from wood-processing or paper-processing factories,'' said Alexei Bychkov, the ISSCM's senior scientific collaborator and a doctorate in chemistry. "Our objective is to make powder fuel from these materials." For example, researchers want to improve standard fuel sources such as firewood, which naturally emits only as much heat as nature has given it. Scientists, however, hope to artificially enhance the wood's chemical component so it can be turned into a fuel with increased calorific value. Researchers are looking for ways to lower the share of cellulose, and to increase the share of lignin. For example, straw or wheat contains about 20 percent lignin. If the share of this substance is artificially increased to 70 percent, then it can increase heat of combustion levels by 30 percent. 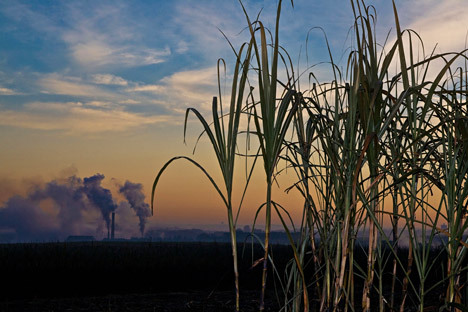 Fueling ordinary furnaces with straw and other plant biomass is not effective. It's better to pulverize such material into a fine matter and burn it in flare burners as a gas. The ISSCM's design department has developed new devices for the grinding process. "Basically, these devices are windmills that not only grind but also change the structure of the substances,'' said Bychkov. "For example, plasticine is difficult to grind, but it can be changed by mixing it with another color, thus changing its structure. The same happens with plant biomass. Our technology can literally `push' lignin onto the surface of the particles and change their structure so the biomass burns better." Together with colleagues from the Institute of Thermophysics, Dr. Bychkov has already tested this new method on powder fuel burned in vortex burners. Next, he wants to analyze the chemical composition of all plant biomass in Russia in order to determine what kind best suits the technology being developed.